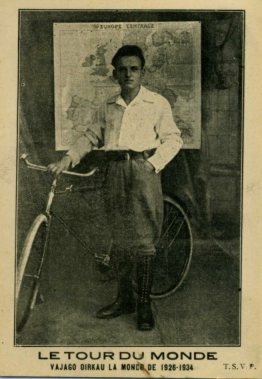 Anonimi (Olanda) - Tour d'Europa e Africa in bicicletta, in 2 anni. 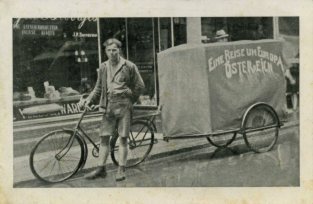 Partiti da Amsterdam nel dicembre del 1927. Anonimi (Olanda?) 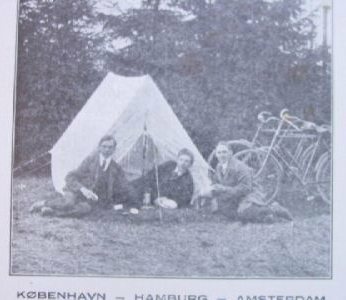 - The object of our journey round the world by cycle, is to make a study of Lands and Peoples. Route: Turkey (Konstantinopel (Istanbul)) - Desert Gobi - China (Peking) - ? 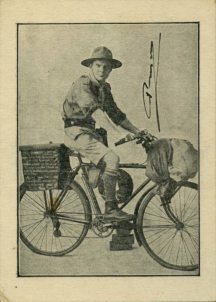 In 1890, two American college graduates set out to travel around the world on bicycle. 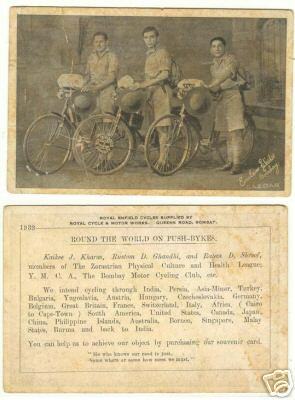 In 1893 they returned, have covered over 15,000 miles." 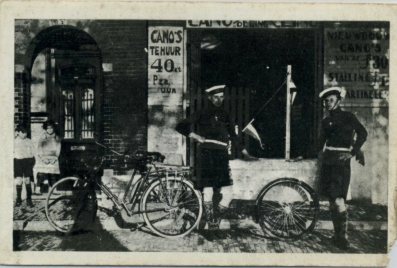 This is their account their trip across Turkey, Persia, Turkestan and northern China. Bradt Nelson A. 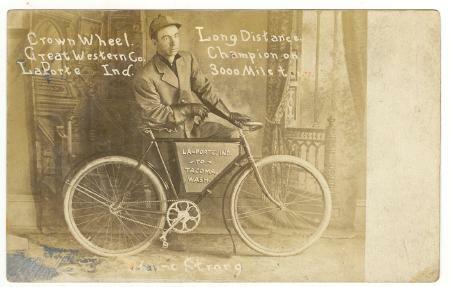 - He travelled across the United States, from New York (April 9, 1891) to San Francisco (July 4, 1891). 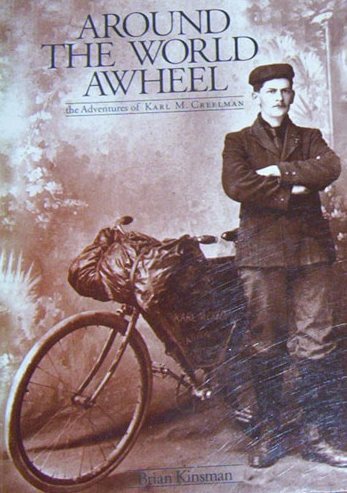 Creelman Karl - a turn of the century adventurer from Truro, became the first Canadian to bicycle around the world in 1902. 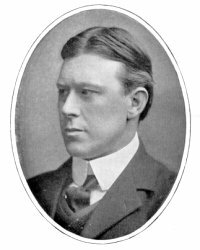 Gray Charles Theron - He travelled across the United States, from New York (June 1, 1887) to San Francisco (October 11, 1887). 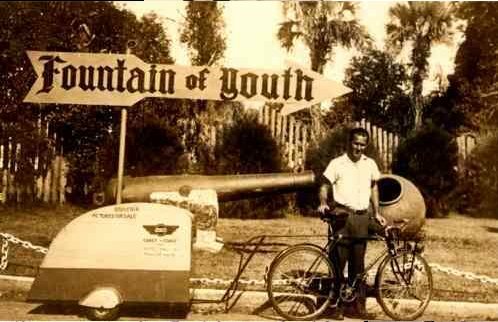 Photo source: Collection of Leslie Gray. 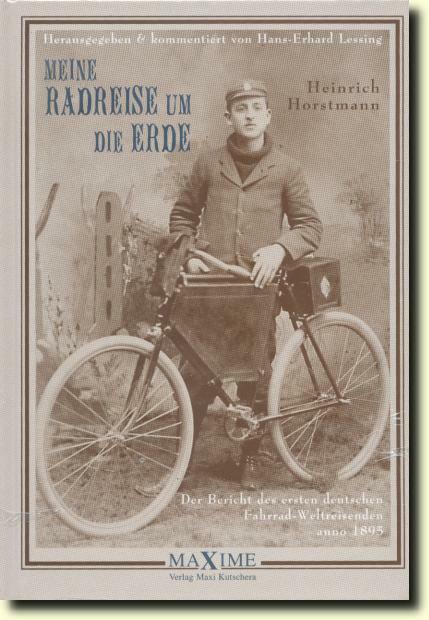 Horstmann Heinrich - 20-years old Heinrich cycled solo Around-the-World by biycycle in 27 months. 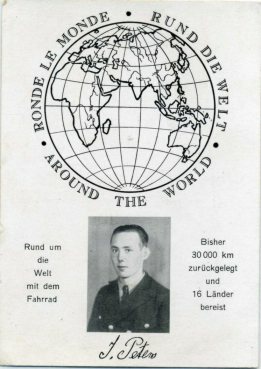 He wrote a book: "Meine Radreise um die Erde vom 2. 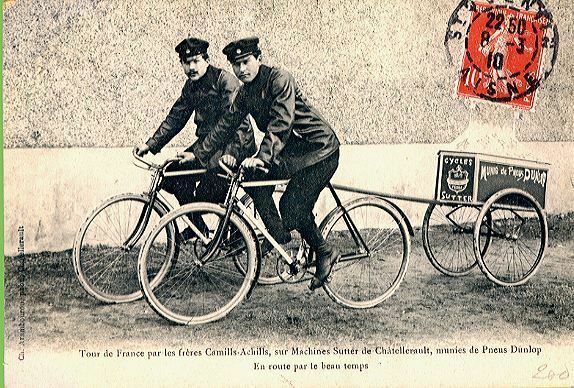 Mai 1895 bis 16. 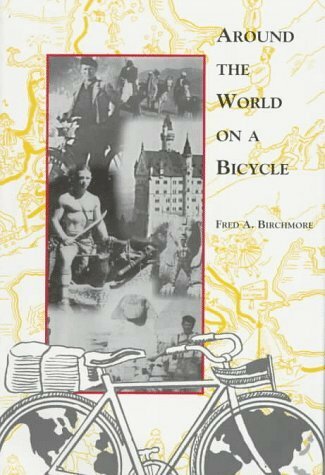 August 1897"
Ha scritto un libro sul suo giro del mondo in bicicletta, iniziato il 2 maggio 1895 e terminato il 16 agosto 1897. 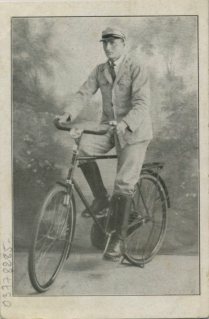 Jooste J.P., Commandant - Originally from Pretoria, Jooste was a champion cyclist before the war. He joined the T.V.K. 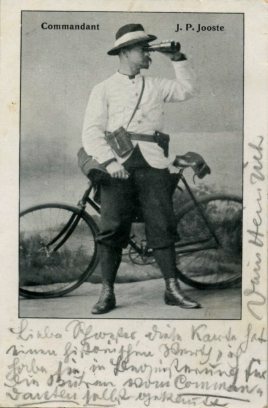 and was one of the leaders of the March 1900 Prieska expedition, which was a failed Republican invasion of the North-West Cape. He went into exile in Germany in mid-1900 and gave many public speeches, raising money & popularizing the Boer cause. 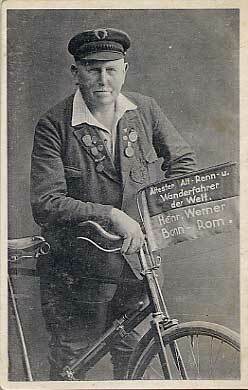 He remained in Germany after the Boer War and died there during the Second World War. 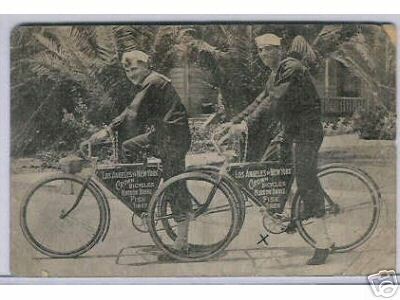 Kharas Kaikee J., Ghandhi Rustom D., Shroof Ratan D. - From Bombay, Round the world on push-bikes. 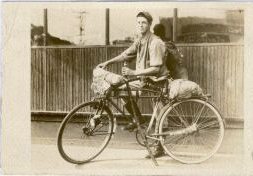 Lenz Frank - (1867-1894) the first to attempt a trip across Asia on a bicycle, rode a Victor. 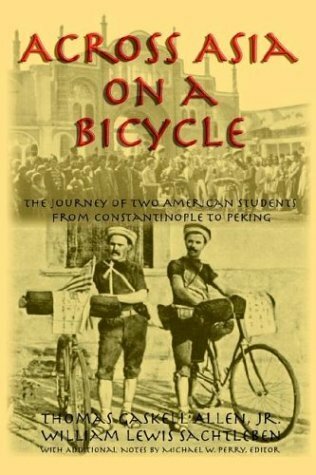 He found no bicycle paths in China or Indian or Turkestan or Armenia. He was murdered when his remarkable journey was nearly completed. Route: USA (New York) - Germany - Kurdestan. Here he was murdered by 5 Kurdistan people. 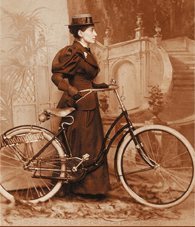 Londonderry Annie - Did you know that the first woman to cycle around the world was a Jewish mother from Boston? 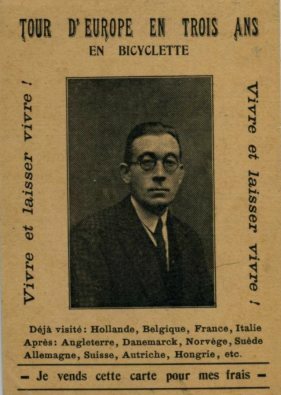 Masetti Luigi - Nato a Trecenta il 28 dicembre 1864, emigrò dal Polesine all'età' di 20 anni, prima a Milano e poi in Svizzera. 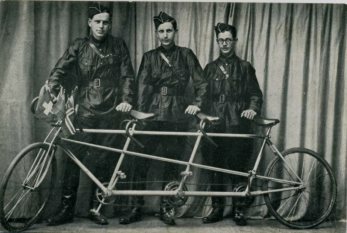 Acquistata con molti sacrifici la sua prima bicicletta - partì da Milano nel 1892 per un viaggio attraverso l'Europa di 3.500 chilometri. 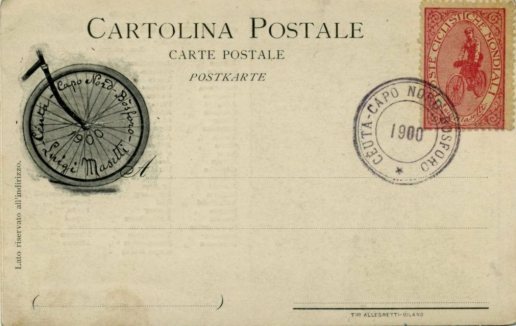 Nel 1893 riuscì a farsi sponsorizzare da un quotidiano milanese una spedizione di 7.000 chilometri da Milano alla grande esposizione mondiale di Chicago (via Svizzera, Germania, Francia ed Inghilterra) e ritorno promettendo in cambio di inviare settimanalmente al giornale un resoconto del suo viaggio. Partito da Milano a metà luglio, arrivò alla meta due mesi più tardi e fu persino ricevuto dal Presidente degli Stati Uniti. 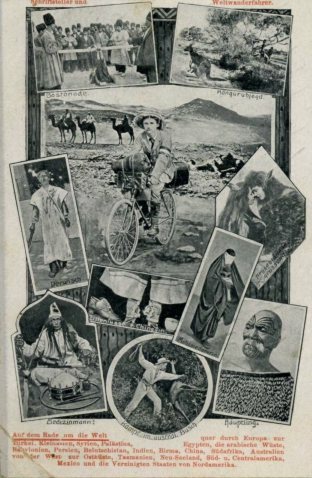 Nel 1897 - sulle orme di Napoleone - partì per un viaggio dalle Alpi alla piramide di Cheope in Egitto e rientro a Milano dopo una visita al medio oriente. Non stanco, accumulò altri 5.000 chilometri sul sellino in un viaggio attraverso l'Italia, la Grecia, i Balcani e l'Austria prima di salire sul Monte Bianco e da lì attraversare la Foresta Nera in un'altra "gita" attraverso Francia e Germania. 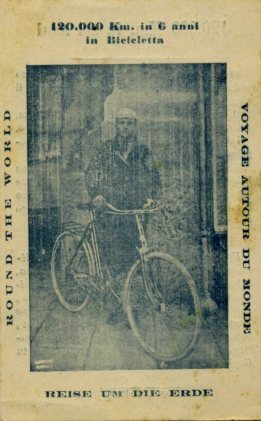 Il primo maggio del 1900 partì da Milano per un viaggio di 18000 km. che lo portò a Ceuta, in Marocco, dove arrivò il 18 maggio, da lì, attraverso tutta l'Europa, giunse a Capo Nord, in Norvegia, il 14 agosto. Da lì, attraversando tutta la Russia continentale, giunse in Turchia a Costantinopoli. 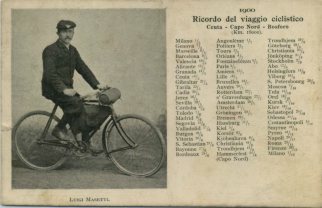 Luigi Masetti (born 1864), after an Europa travel in 1892. 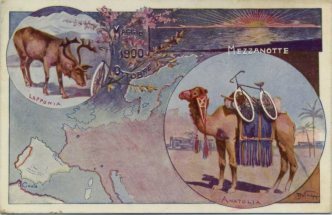 In July 1893 he travelled 4,300 miles from Milan to the Great World Exposition of Chicago, and he even met Grover Cleveland, President of the United States. 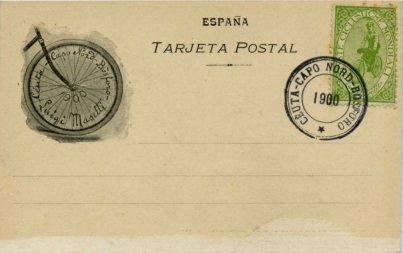 In 1900 he travelled for 18000 miles, in the route Milan-Ceuta (Morocco)-Nord Cap (Norway) and across Russia he reached Costantinopoli. 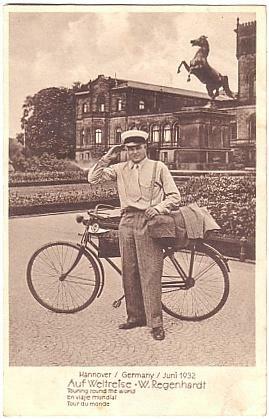 In this travel he edited some postcards and a cinderella. 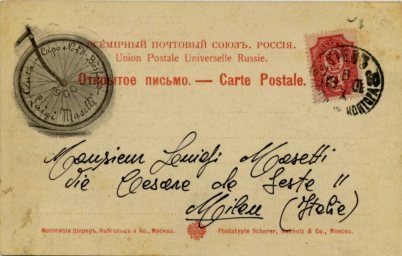 (In the last photo you can see a letter written from Masetti himself). 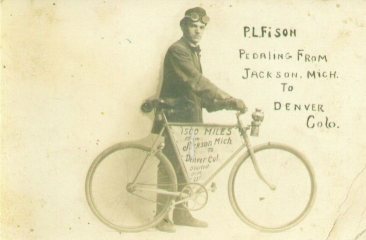 Nellis Jr. George W. - He travelled across the United States, in 1886. 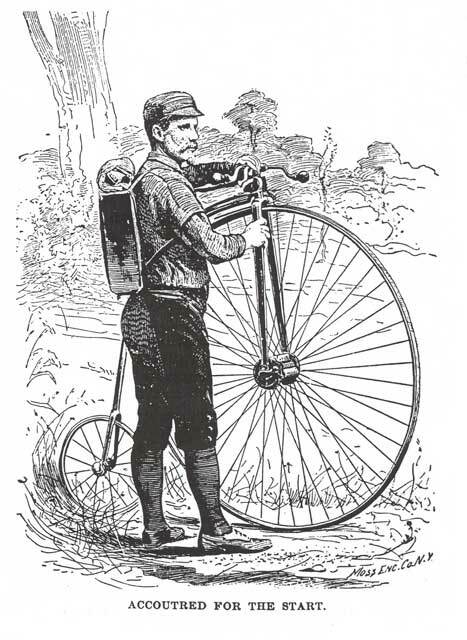 He departed from Herkimer on May 24, 1887, reaching San Francisco in 72 days, on August 4, 1887. 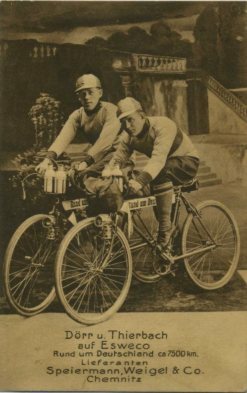 Rogers Dexter M. and S.Walter - The Rogers brothers started their transcontinental ride at Plymouth Rock on Monday morning, April 26, 1890. 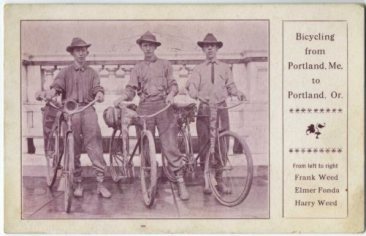 They arrived in Portland, They arrived on September 15, 1890. 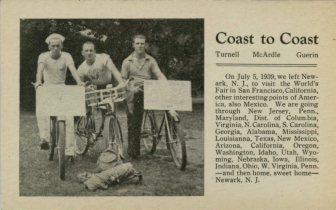 Sheneman William Henry - From Seattle, Washington to Marysville, Ohio on a Fowler Truss frame wheel in 53 days, covering over 2,600 miles on eighty-five dollars and fifty-nine cents. 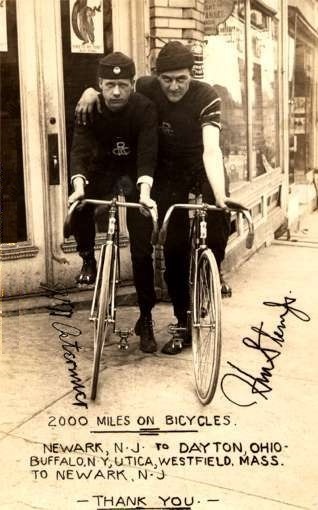 That is how William Henry Sheneman spent the summer of 1896. 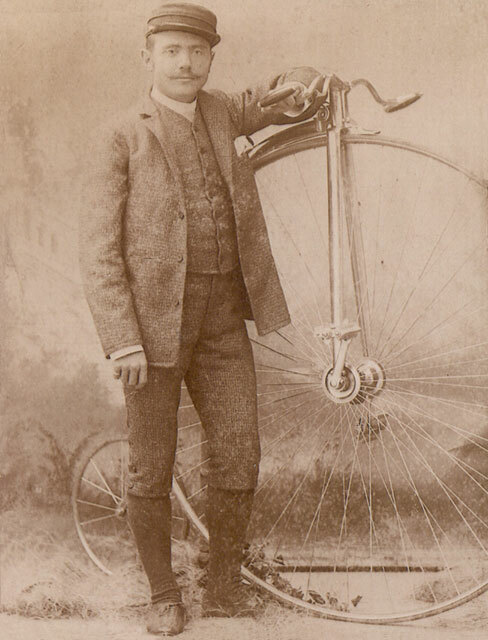 Spier Stephen G. - Born in 1865, he travelled across the United States in 1886. 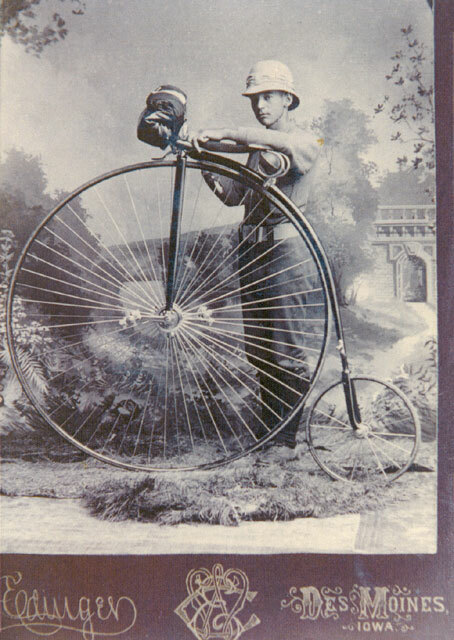 Stevens Thomas - Thomas Stevens left Oakland, California in 1884 on a Columbia Standard, and became the first person to pedal around the world..
Nel 1884 Stevens (nato il 24 dicembre 1854 a Great Berkhamstead nel Hertfordshire, in Gran Bretagna, ma emigrato giovane negli USA), eseguì il giro del mondo con una bicicletta a ruota larga, scrivendo anche un libro sull'evento. 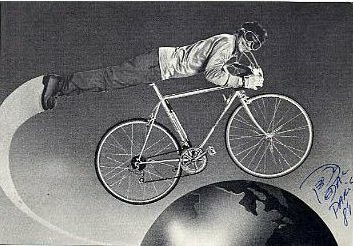 Il viaggio di Stevens ebbe inizio a San Francisco: secondo le cronache dell’epoca, tratte soprattutto dal Harper’s Weekly, il nostro lasciò la città californiana in sella alla sua 50" Penny Farthing nera alle 8:00 in punto del mattino del 22 aprile 1884 diretto verso est. 990 giorni e 21.700 chilometri dopo, riapparve al punto di partenza a bordo di un battello a vapore. 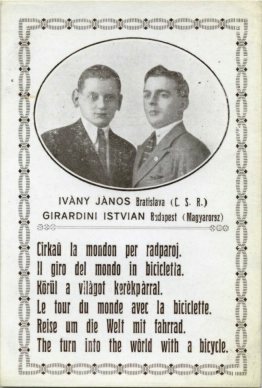 Come è facile intuire, il viaggio non fu tutto compiuto in bicicletta né Stevens pedalò ininterrottamente per 2 anni, 8 mesi e 16 giorni. 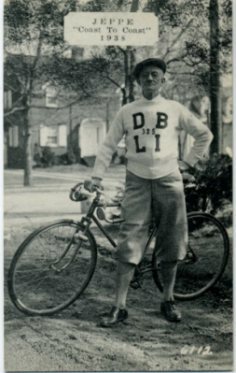 Thayer George B. 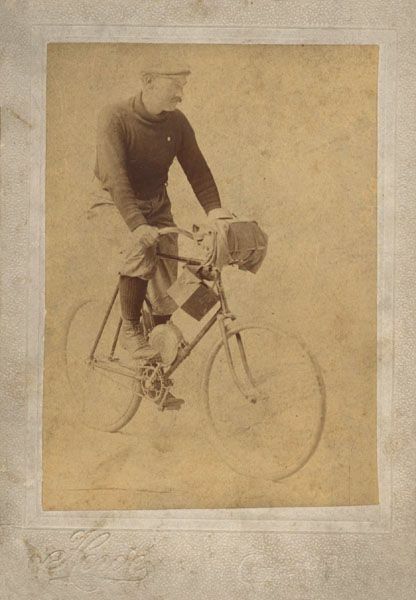 - Mr. Thayer was the consummate bicycle tourist who made a circuitous seven-month pleasure trip of 11,000 miles across the United States and back by wheel, ship, and train (1886). 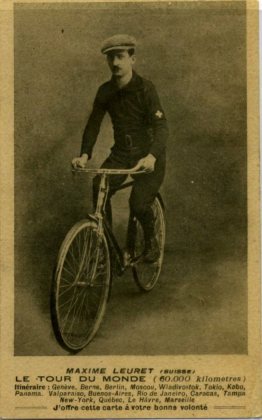 Van Meerbeke Fredrick E. - He travelled across the United States in 1886. 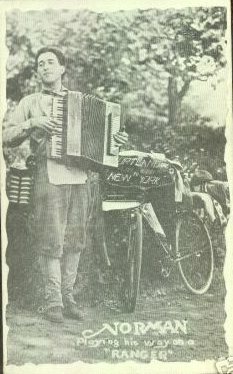 He began the ride from the New York City Hall at noon on March 1 on a Columbia ordinary with the hope of reaching San Francisco in 150 days. 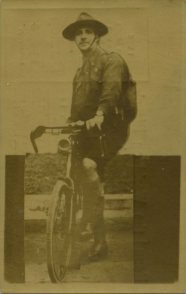 He arrived in San Francisco about September 9th (Admission Day), having covered more than 4,000 miles in slightly over 190 days. 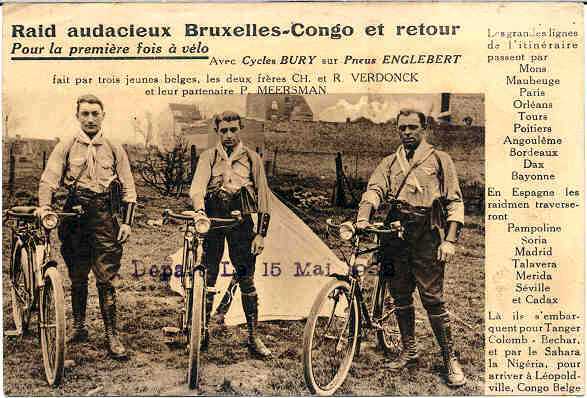 Verdonk brothers and Meersman - Bruxelles-Congo et retour. 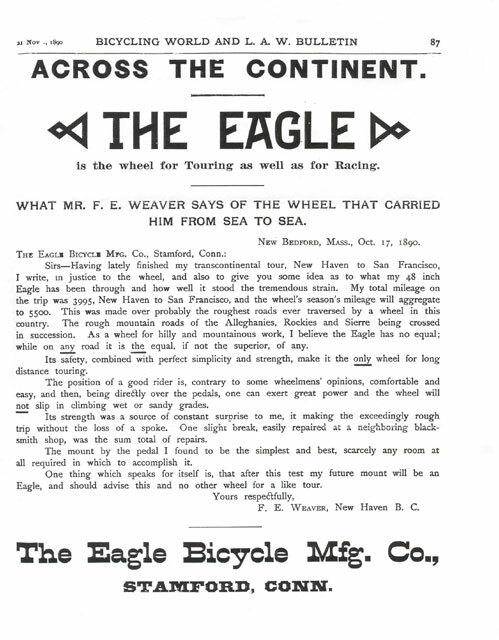 Weaver Frank E. - Hetravelled across the United States in 1890. 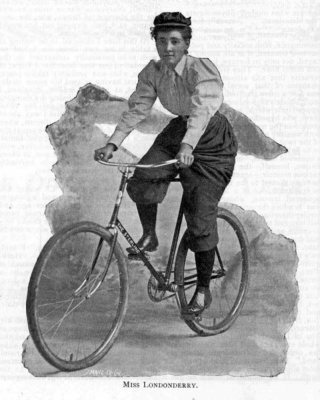 Fanny Bullock Workman was born in Worcester, Massachusetts on 8 January 1859. 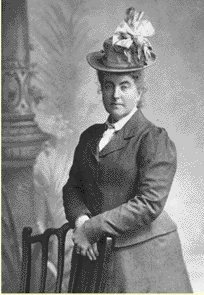 A child of privilege (her father was a former governor of Massachusetts), she married William in 1881, who retired from his medical practice soon after. 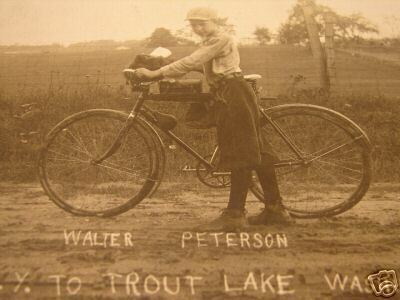 The couple had one child, Rachel, born in 1884, who later became a geologist. 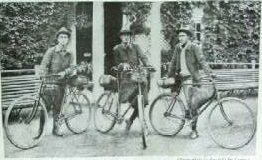 In 1889 William and Fanny began their decades of professional travel by a soujourn to Europe, settling semi-permanently in Germany by 1890. 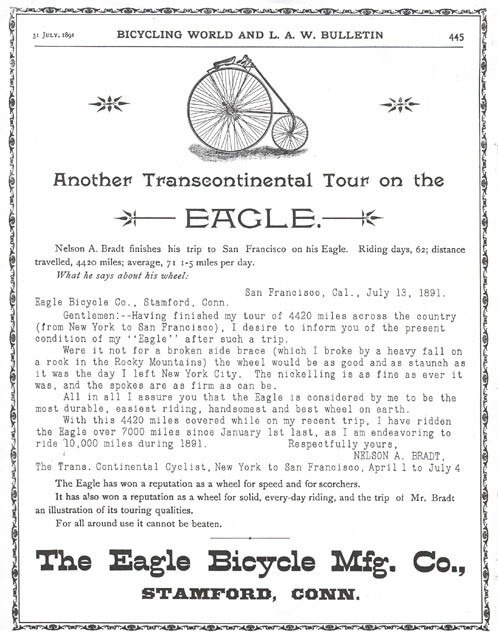 1890 also marked the beginning of the Workmans' bicycle tours. 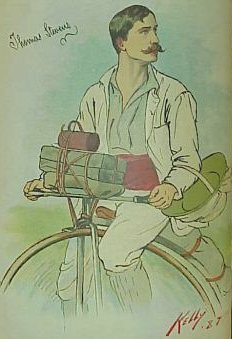 First cycling across the back roads of Europe and charting new pathways for fellow cyclists, the Workmans published their first travel book in 1895, after a tour of Algeria (published here). 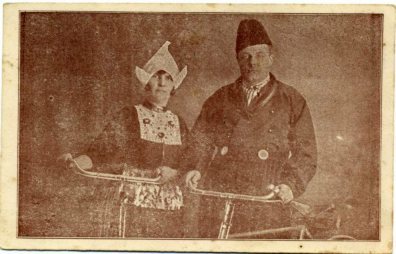 The couple then turned to the Far East, cycling across Asian countries and the Indian Subcontinent in 1897 and 1898, and publishing more travel accounts as they went. 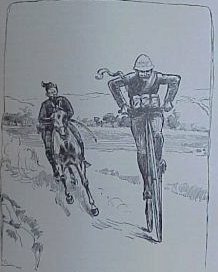 By 1898 another type of travel excursion was emerging: mountain climbing. 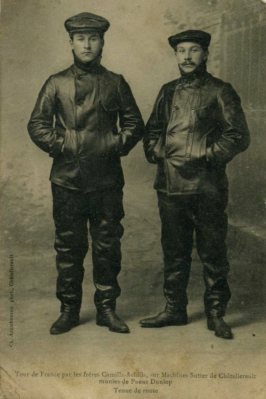 For the rest of their careers Fanny and William molded themselves into quasi-professional mountaineers and surveyors, eventually completing eight Himalayan expeditions between 1898 and 1912.